I am getting on a bit and whilst my distance vision remains very good, anything closer than 3 feet away and smaller than a tic tac is just a blur these days. Anyone got any tips?, I have considered sticking some of those stick on lenses they sell to put in diving goggles in y riding goggles, but not sure if they would make me go all wobbly when I look down and crash!!! I mark up my maps and enlarge them so I can read them without glasses. Never used GPS for trail riding but I would have the same problem you have. Convert a flip down visor into reading glasses? Maybe I could make my millions with that idea. Cheers both, a couple of good ideas there. Never knew about the safety glasses. Know a few who use these. 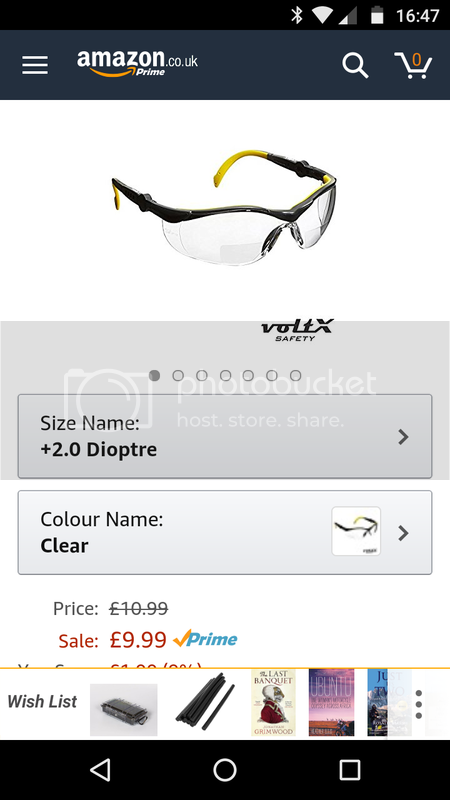 Also Voltx safety glasses. Bifocal, clear around £10, tinted £13 both from Amazon. I don't find the end of the arms helmet friendly so I snip off the last inch or so. Still secure inside a helmet. These are the ones I went for. The straight arms go in no bother on a helmet. My experience with phones of getting larger and larger screens had shown that even riding around with a laptop on my handle bars would not solve the problem. I don’t even notice I am wearing them other than I can clearly see the small screen on my etrex legend for the first time in about 5 years. So a big thank you to Sean from East Mids who mentioned them to me. Just got some Bolle glasses from the bay...what a great idea, havn't been out with them but a quick walk around the Garden whilst glancing down at my phone screen has proved they work as intended...nice clear view ahead and just enough of a magnified section at the bottom to read the close up stuff. (and might I suggest just one small example of the sort of thing the wide knowledge and experience shared on a uk wide forum can be helpful for, as opposed to a small closed fbook group with just a few members.